Trend modification of the car more popular since a few years back. In line, of course bring profits for aftermarket businessmen, including the workshop rim. However, not all businesspeople honestly deliver their products to consumers, such as information between the original rim with a replica. Well, if you want to buy a car rim definitely do not want to be fooled into buying a fake right? Berikud is a way of distinguishing between the original rim and the replica. 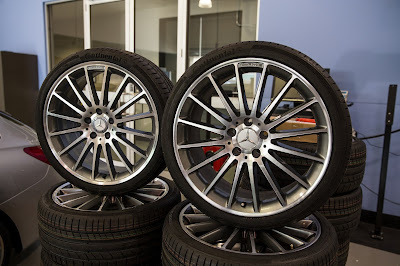 The first easy way to distinguish replica rims with the original, is to pay attention to the end result of the product (finishing). the original rims and replicas are very different in the finishing, just look at the color is different and not neat. Then, note the rim bottom material. The easy way is to weigh the rim weight. Usually heavier. Another easy way, is to look at the number of bolt holes and the size of the hole diameter (PCD-pitch circle diameter), it is by comparing. If for example the original rim there are 8 fake holes usually 10 holes available. This is a common thing. Although depending on the brand and the popularity of these wheels, but the price of the original wheels can reach 5 times more expensive than the price of replica wheels. With these prices, it can be understood because the original wheels have a better quality. But be careful too, because expensive alloy wheels are not necessarily original. There are also naughty traders who sell replica velg with a high price and claim that the wheels they sell are genuine goods. Although both are made with aluminum alloy material, but the original wheels tend to have a lighter weight than the replica. This is because the replica manufacturer only takes the design of the popular wheels, but can not match the material mix. This weight difference alone can reach 30 to 40%. Most imported replica wheels still do not imitate to the emboss brand or emboss detail. Typically, replica or fake wheels will change slightly in this section. Suppose the original wheels have the words "Made In Japan", then the replica will make another writing like the example "Designed id Japan". Or it could also change brands like VolkRays to YolkRays.